The heart of the bell-ringing season is coming up for the Salvation Army, and volunteers are still being sought to stand watch over the collection kettles around Knoxville. 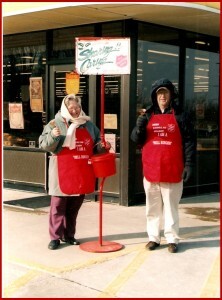 Three kettles are positioned across town, each in front of one of the local grocery stores; volunteers ring the bells every day except Sunday, and people are needed to fill shifts daily from now through Christmas Eve. Merna Furney is a member of the First United Methodist Church, and coordinates the schedule in Knoxville; she tells KNIA/KRLS News there are still plenty of slots open for individuals or organizations willing to take one of their shifts. While the schedule is set up to have single volunteers take two-hour shifts, Furney says they can break up into one-hour segments. They can also have two-person shifts, which helps to pass the time while working. Any person or group willing to help out should contact Furney at 641-842-3072.